Bozeman, Montana was sort of an accidental stop on our trip. We wanted to stay near Yellowstone National Park or Grand Teton National Park, maybe Jackson Hole, but at the peak of summer tourist season we just couldn’t find the right place for us. Bozeman seemed like the best town that was reasonably close to the parks, so we spent a few days there as a National Parks crash pad. It turns out that Bozeman is pretty happening. Travel and Leisure named Bozeman one of its best places to travel in 2016. It’s a nice-sized town, close to the mountains and with a distinct hipster feel. We didn’t have too much time to explore Bozeman, but we packed in a few fun activities in our limited time. Most of our time in Bozeman was spent discovering nearby Grand Teton and Yellowstone National Parks. You can read about our adventures in Grand Teton here and Yellowstone here. Bozeman was a bit of a haul from both, but certainly not TOO far. It’s close enough that both of our parks trips were single day endeavors. We ended up eating a lot on the road back and forth to the parks and cooked a bit in our Airbnb, but we did venture out for a few meals. When we saw the picnic setup at Feed Cafe we had to stop. I had a savory oatmeal with bison short ribs, mushrooms and a fried egg to start my day. We also headed to Ted’s for a quick steak, and grabbed some really delicious burritos at La Parrilla. And I couldn’t leave town without trying some of the famous Granny’s Gourmet Donuts (totally lived up to the hype). We also did a little shopping along Main Street. The many outdoor outfitter shops were fun to see, and the “do not load” buffalo plaque was the best item I spotted. This was shortly after some visitors to Yellowstone had put a baby bison in the back of their car because they thought it was too cold. After this human interference the bison was euthanized. Never touch wild animals, for your safety and theirs. I didn’t want to leave without checking out the Museum of the Rockies, so on our last evening in town I took a quick trip there. I spent most of my time checking out the many dinosaur fossils and models. 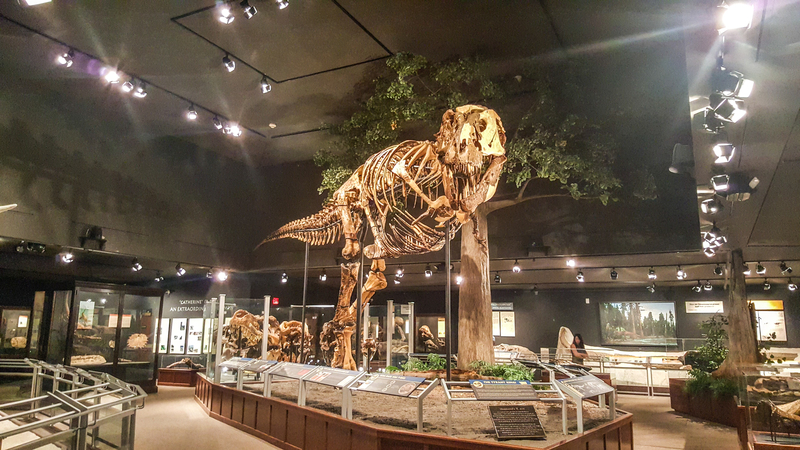 Montana is the site of many important geologic and fossil discoveries and it’s wonderful to have so many on display. The reason we had to take day trips to Grand Teton and Yellowstone was because of forest fires in the area. I had never been close to a forest fire, so this was a new experience. I figured the fires were far enough away they wouldn’t impact me. Wrong. I woke up one day, took a look out the window and thought I was on Mars. The sky was a hazy red color and the sun was a bright red ball. It looked exactly like low, translucent clouds in front of the sun. Instead it was thick smoke, creating the spooky looking sky. It was totally foreign and totally weird. The other new experience we had was learning how to fly fish in the Gallatin River. We took a class through Montana Whitewater. No one else had signed up for our time slot, so Eric and I got a private lesson. Fly fishing is a really interesting, involved sport that takes a lot of practice. I was simultaneously frustrated by its complexity and excited to learn and practice more. I’m looking forward to more fly fishing in the future. After cramming a whole lot of activities into less than a week in Bozeman, it was off to Kalispell which would be home base for exploring Glacier National Park.